“Why are you doing this? Aren’t you scared of the water?” Before I left for Silago, Southern Leyte more than a month ago to do some volunteer work, I received this question from a friend who knows how deathly scared I am of the water. I often ask myself the same question ever since I got into marine conservation. “First of all, I care. Secondly, if I conquer this fear, I can safely say that I’m no longer afraid of anything.” Of course, I was wrong. After being in the water almost everyday for a month, I am deathly scared more than ever. I fear, not life in the ocean, but the possibility of losing it. 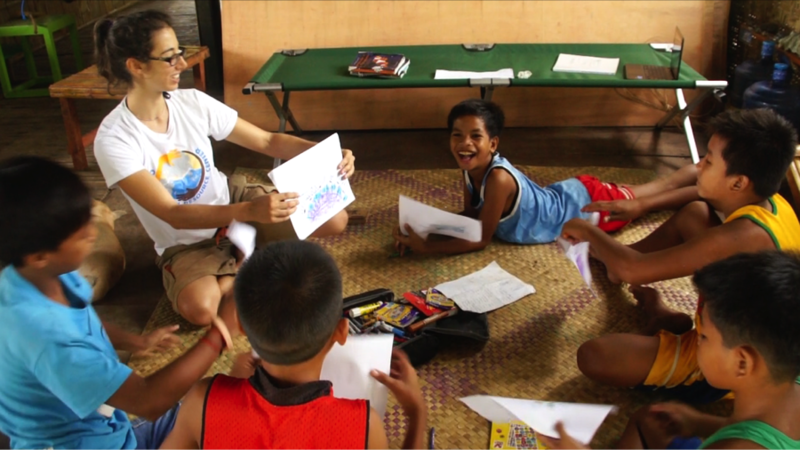 I spent the whole of July in Leyte with fellow volunteers for Ocean-Action Resource Center (ORC), a non-profit organization that aims to bridge the gap between local communities and the global movement for conservation through the convergence of different disciplines. 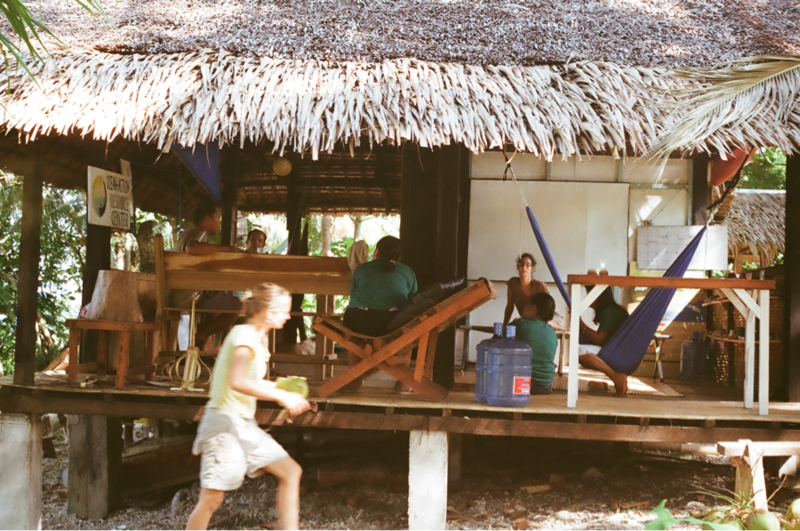 I lived with Jackie, an anthropologist from New York; Julia, a fisheries scientist from Germany; Bobit, a community developer from Ormoc; and Grace, the founder and Executive Director of ORC who is actually from Silago, which explains ORC’s grassroots program. 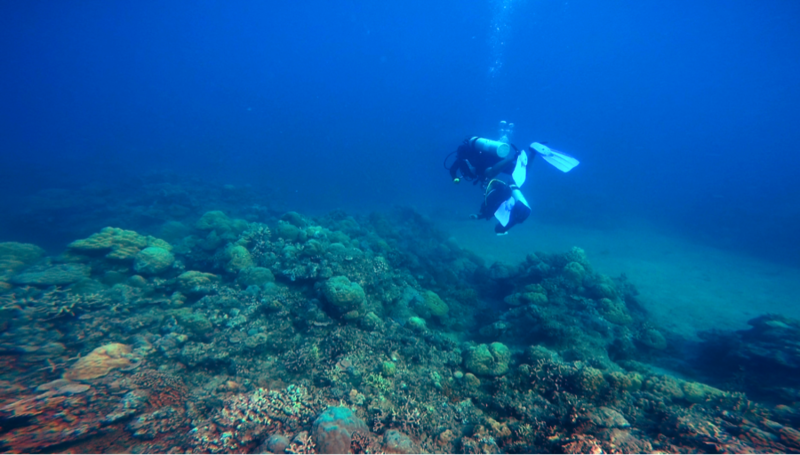 As part of my volunteer work, I had the privilege to dive and snorkel in some of the most beautiful marine protected areas (MPAs) in the Philippines. One is the Napantao Marine Sanctuary in San Francisco, Southern Leyte and the other one is in San Pablo island in Silago, just a 15-minute boat ride from where I was staying. These marine protected areas are part of 2.4% of the coral reefs in the Philippines that are in excellent condition. 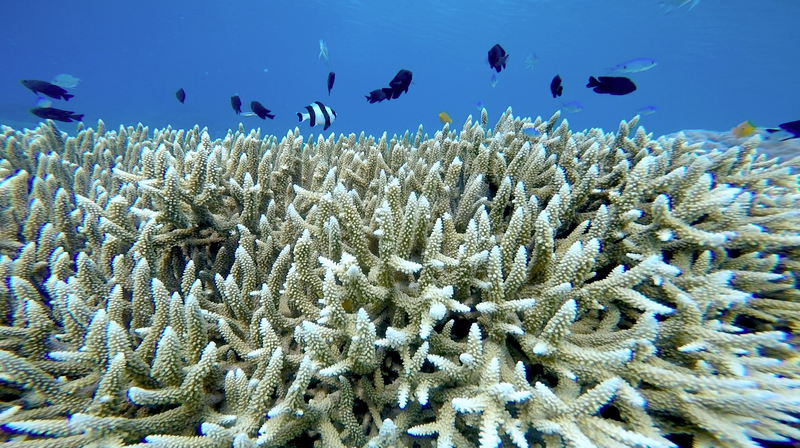 This means that live corals cover at least 75% – 100% of the area. That we’ve only been able to maintain and protect 2% of our coral reefs is already saddening but worse, these numbers were from a study done 20 years ago by Philippine biologist Dr. Edgardo Gomez and his colleagues. We can just imagine how much these numbers have declined since. But of course, in any plot, there comes a point of conflict. Just a few meters from the sprawling hills I have come to love was an area full of dead corals. Their limestone skeletons lay on the sand, and looked like they were remnants of an ancient city bombed from above. 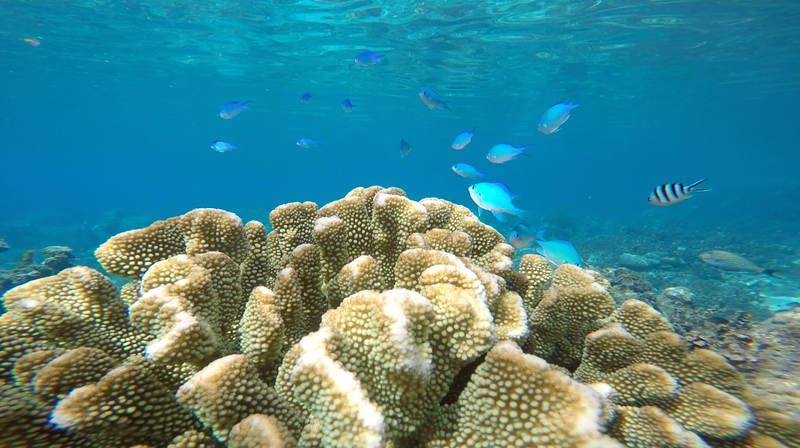 Marine conservation touches a lot of important issues: climate change, global warming, ocean acidification, coral bleaching, and the collapse of fisheries all over the world. But how do you make it relevant for local communities whose primary concern is to fish and make a living? One thing I learned from my stay in Silago is that we have a chance to convince communities that the gratification from protecting marine life, however delayed, can override the instant benefits of a big catch. Barangay Balagawan in Silago has a people’s organization called Balagawan Lihok Katawhan or BALIKAT. Through their partnership with ORC, they have established a micro-financing mechanism wherein they each contribute their earnings to the group’s “bank” in the form of a steel box. 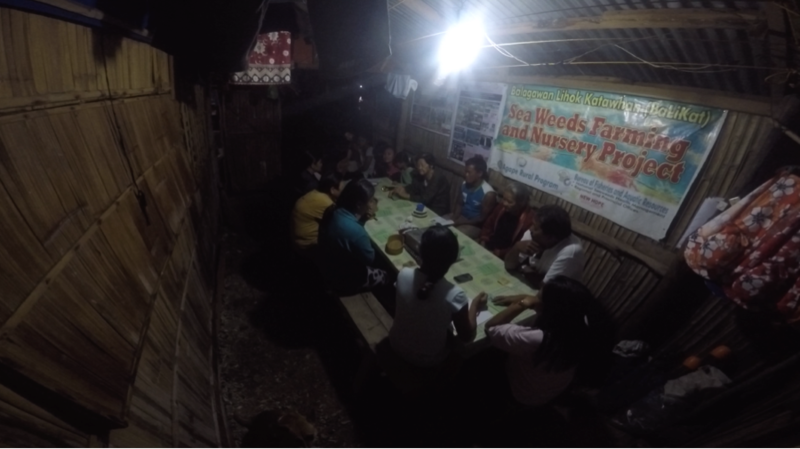 They have regular meetings to discuss how they can appropriate their funds into their projects. Sometimes, a member would need emergency assistance and everyone casts vote to allow the member to take some money from the steel box. One of the solutions that the people of Balagawan has been working on is the provision of alternative livelihood. Right now, they are exploring seaweed farming as a way to augment their daily earnings. Seaweed farming is one of the fastest growing industries in the Philippines. In fact, in 2007, seaweeds rank third among fishery exports according to the Bureau of Agricultural Statistics (BAS). It has less environmental impact compared to fishing and other extractive industries. Planting and harvesting are also very safe as they do not involve any risky activities. The only main requirement for a good seaweed farm location is an environment free from domestic, agricultural, and industrial pollution. One night in Silago, we watched the documentary “End of Line,” which was about the collapse of fisheries industries all over the world due to overfishing. According to the documentary, fish species are starting to disappear and fishermen have no option but to fish down the food web, which means that someday, all we have left to eat are jellyfish. I hope it doesn’t come to that point. The men and women in Silago are doing something so it doesn’t come to that point. I watched them take a step away from themselves, and a step forward for the ocean, and if they can do it, what’s stopping big corporations from doing it as well? In Silago, I have come to believe that this country is still abundant with people who are willing to make a difference. What is commendable about people’s organizations such as BALIKAT is that they address social problems affecting local marine conservation efforts, such as livelihood. Conservation is a business of changing culture and mindsets. There is no better way than to start early. We would delight on their expressions and reactions upon learning this fact, and watched them turn to innocent grim whenever we would tell them the threats to the ocean. The Philippines is an archipelago composed of 7,107 islands with a coastline spanning to around 36,000 km. Imagine how many people live along these coastlines. Imagine how many mouths feed on fish and other seafood. Imagine how many children would grow up to be fishermen. 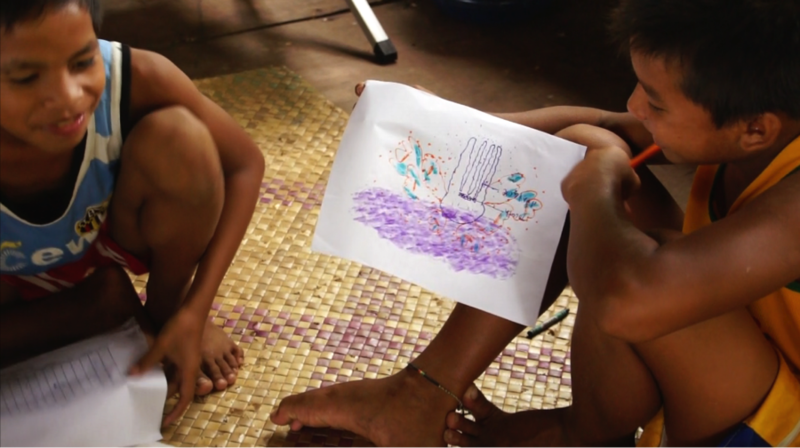 If values education is required in public schools all over the Philippines, marine conservation should also have a special place in the public education system. It has been a long and winding road for conservationists who are trying to seek for the attention and assistance of the Department of Education. It seems that the finish line is still far into the horizon. I personally think that along with values on respecting other people, children should also be taught to respect other forms of life. What Is Life without Them? Whenever I’m in the ocean, I don’t feel any barrier between me and other forms of life. I can physically feel the water molecules seeping through my skin as the molecules of my body disperse itself in the vastness of the ocean. I am not above or below anything else. I am just part of it. Without other forms of life, we are nothing. Dolphins have lived thousands of years even before the first homo erectus stood up to get a banana. Sponges are ancient and came to existence even before the invention of square pants. The world can survive without us. But how would we survive without them? The ocean provides us basic commodities such as food and oil, and according to recent studies, ocean services are worth $23 trillion a year. But more than that, the ocean gives us things that money can never buy. It helps regulate our planet’s climate, it removes carbon from the atmosphere, and it is an important source of biomedical organism that can fight human diseases. The ocean accounts for two thirds of the natural services we need so we could live. With his passing, we realized something else. Life is good, but more than that, life is short. This lifetime is not enough to make big waves of change, but the biggest waves started with a ripple, and that is more than enough. Paola Ceriola calls herself a “SEAtizen” of the Philippines. 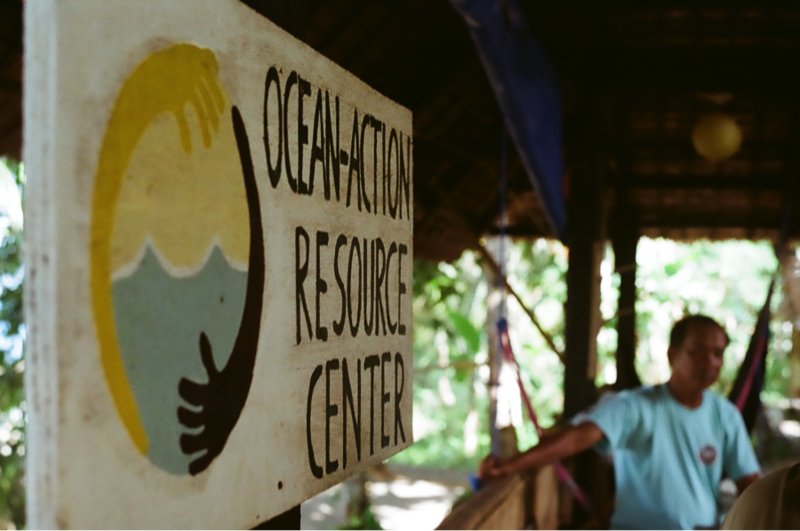 She spent a month in Leyte with the Ocean-Action Resource Center. Before that she was a volunteer for Save PH Seas, under which she launched her project “Alon,” promoting marine conservation education in her hometown in Albay. She is currently studying the model of BALIKAT in Silago for possible implementation in Bicol. She is a freelance Television producer, and currently taking her Masters degree in Philippine Studies major in Development from UP Diliman. I love doing citizen science volunteering. Thank you for your contribution and sharing the story! Thank you for that beautifully well written essay. Let’s make ripples, many many ripples.